We don’t have an exact completion date for our tiny house on wheels yet, but our builder says that construction will start around the end of March. Since our house is partially built, the work shouldn’t take too long — about a month. We continue to move forward, inch by inch. So far, this process has been very stop-and-go, and I’ve felt mentally stalled at times. There’s been a lot of planning, not-doing, and living in my head since we embarked on this adventure a year ago, when we signed up for a tiny house workshop last January. I’ve felt much better since October, when Nick and I discussed what we could realistically handle — which unfortunately wasn’t much — and decided to hire a professional to finish the house. Our builder towed our house to their site in Santa Cruz in December, just before the holidays. Now, after settling back into my routine post-vacation, I’ve slipped into limbo again, waiting for the next phase. I’ve been humming along as usual, busy with work and things — and trying to stay sane living at my parents’ home — just knowing that at some point, everything will begin. Working with our builder to finalize materials, appliances, and finishings. Purging our existing belongings (again), as I still think we have too much stuff. Securing what we need for our new house. (I just ordered the Wonderwash, which we’re planning to use for small laundry loads.) Then, packing and moving. And moving to where, exactly? We don’t know. One key component of this plan — where we’ll park and live in this tiny thing — is unresolved. We have a “Where to Park?” page with a contact form for potential leads, while I’ve searched for listings on Craigslist and other sites. There are slim pickings, and with the exception of two legit potential hosts who have contacted us, most of the messages we receive are from people, like us, who are building a house on wheels and looking for a place to park it. We’re looking, too — can you help us? Want to purchase land together and start a community? From our talks, we’d like to move further out of the San Francisco Bay Area. I won’t speak for Nick, but I personally want — and need — a big change. San Francisco itself no longer speaks to me; it’s not the city I fell for when I was younger, and both the city and the surrounding area really rub me the wrong way. It’s a bit sad to feel displaced in the area in which I grew up — which is, by default, home for me — where all of my family and a few of my oldest friends live. But after traveling so much over the past few decades, I feel there’s so much more out there. San Francisco feels so empty right now: it’s still beautiful, but soulless. These thoughts are for another time, really. Just know that I long for something different right now. We’re open to moving the house out of state in the future (Oregon? The Southwest? Across the country?) but first, the idea is to feel things out. To jump into this new life and routine but physically place ourselves in a somewhat-familiar setting. I think it’s important to start slow, as the location is just one change among many. The Coconut, a micro-house in the backyard of a home in Kailua, Oahu, where we stayed earlier this month. Parking the house on the property of a waterfront home, along a river. I imagine hopping in my kayak soon after I wake up, paddling first thing in the morning. Returning to find Nick on the porch, sipping his Chinese tea and reading on his phone. I think about friends visiting over a hot weekend, meeting them at the beach or the brewery upstream. Parking the house on a sunny ranch or farm. I envision sitting at our breakfast table, sipping coffee and looking out the window, staring at rolling hills and acres of vineyards. Writing early in the morning, then heading into town to work for the day in a cafe whilst doing our laundry. Meeting my family on a Sunday afternoon, wine tasting and picnicking at a winery down the road. Parking the house in the woods, up a mountain road. I think about working until lunchtime, as the fog burns off. Going on a midday hike in the forest, on a lush trail leading to a waterfall. Returning to work more and later spend time with Nick, playing cards or lounging and reading — silently yet together. On Saturday, we head to the coast to paddle and play, or go roadtripping along the sea. A shot of our rented kayaks on the Russian River in Northern California, when we paddled in July 2014. For someone who has always loved to travel and try locations on for size, window-shopping for places to live, this tiny-house-on-wheels project is incredibly exciting. As I get older, I’ll admit I’ve become a walking cliché, wanting a mix of both worlds: of roots, of wanderlust. I’d like to keep exploring in the physical, geographic sense: to figure out what home means to me, to travel freely, to visit family abroad — while also being able to own a home outright and shape it as we go. Our 131-square-foot tiny house on wheels is an experimental playground for all of this, giving my husband and me the ability to try and learn new things, and to — ironically — give ourselves the space to personally grow. 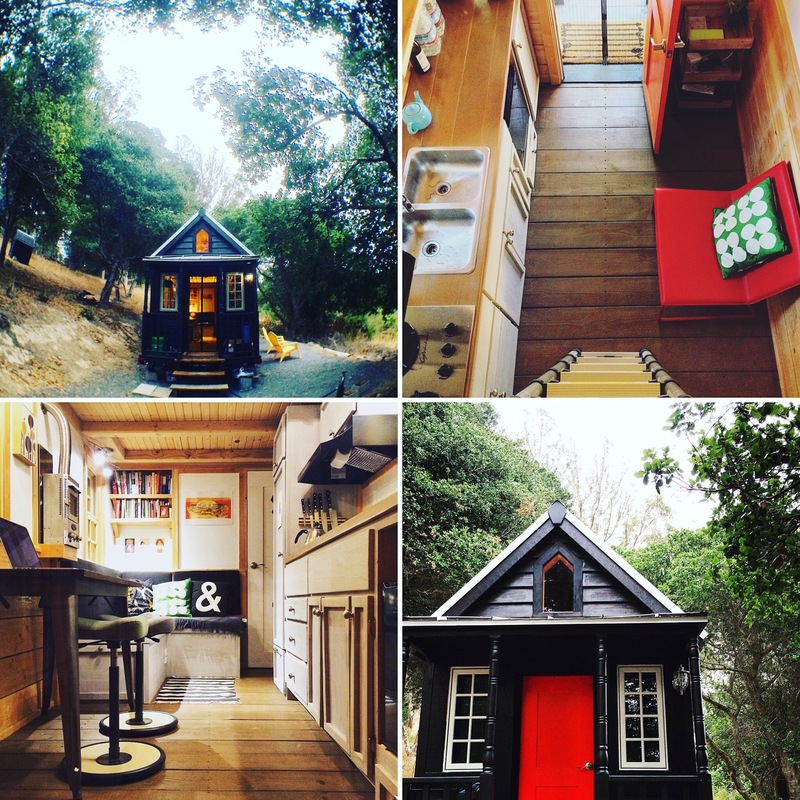 A tiny house on wheels in the woods of Healdsburg, where we stayed in March 2014. The stretch along the Russian River between Monte Rio and Duncans Mills. The woods of Healdsburg, within a fifteen-minute drive to the center of town. A sunny patch of land in Anderson Valley, off of Highway 128, close to Philo. In the Santa Cruz Mountains, living steps away from state parks and dense forests, but also the beautiful beaches of the Central Coast. It’s so easy to get caught up in daydreams, to romanticize all of this, to get lost in the fog. But I realize I should be careful, dreaming of the perfect host location and plotting it on a map, blinding myself from other possibilities. It’s so easy to get caught up in daydreams, to romanticize all of this, to get lost in the fog. That’s what I mean about living in your head, which is easy to do when you “have a plan” — and when you have a house floor plan you can’t help but obsess over — but nowhere to put the house. In these few months as we wait for construction to begin and secure a place to park, I’ll continue to shape these possibilities in my head — ultimately, I’ll permit myself to dream — but must keep my mind wide open. While we have a clear vision and firm goals, the beauty of this journey is paving our own path, winding as it may be, to get there. I found your blog through ‘The Daily Post’ and already hook up with your writing. I instantly click you blog and have a quick look around several posts. As interior designer and (new) blogger I attract in a minute on your ‘Tiny House’, what a beautiful project you have done! I always like to live mobile on a small space, glad to read your post about the project. It inspires me a lot. Thanks Cheri! Me again. Hey, I published a post a couple weeks ago about tiny houses. And today I got a comment on that post that included a YouTube of a tiny house that knocked my socks off. This is my link, and the YouTube is the last (44th) comment. Make sure you’re sitting down before you watch it. Really. I know. Next time I get to New Zealand, I’m going to Grand Theft Auto that rig! Tiny houses appeal to me sooo much. Isn’t there a community of them in Santa Cruz…or is it Santa Barbara? You might not like living close to a bunch of people. Alone, by the river…yeah. There’s a village in Lemon Cove (central California), and Jay Shafer at Four Lights has talked about his “Napoleon complex” community in Sonoma, but I don’t know if that’s happening. There are also pockets of communities in Portland, DC, and other cities. But you guessed correctly — we were never really interested in community living in this way. We’ve chosen to live in Sebastopol, which I think is a good spot to park — there are tiny houses here and there, and people I’ve talked to have been generally open about it. So, I’m excited. See, this kind of thing excites me. At this moment, I want to build a (not-so-tiny) house. I’m thinking to build one on the back of a thirty-foot truck trailer. I know, not “tiny.” But a guy needs a place to do yoga. And pee. But no worries, tomorrow I’ll be wondering where I’ll be traveling in June and making flight reservations. The roof on your house must have been expensive, eh. Very lovely. I’ve been reading your WordPress ‘writing about writing’ posts for a long time. I finally decided to click on your name and see who this person who always gives good writing advice was. Lo and behold! The first post I see is about Tiny Houses. I read you post, and I can understand the desire to be somewhere new, to be somewhere simple. Twenty years ago I would have laughed at the idea of a tiny house. Now, the idea of a home that provides shelter, a place to sleep, cook, and wash up … that’s really all I truly need. My partner and I have talked about it, and when we think about the cost of keeping a large house, the over-abundance of ‘stuff’ we own, we realize that we’re ready to simplify and downsize. I envy the fact that your Tiny House dream is close to being a reality — and I hope that you find a place for it: a quiet, peaceful place. I’ve been a huge fan of the tiny house for more than a decade…such a great path you both are creating. Cheers! We sold our house a year and a half ago and moved into our RV full-time and haven’t looked back. The minimalist lifestyle can be liberating. Good luck finding that perfect spot to park your new home. Can you give me more info about the house you stayed at in Oahu? Is it still for rent? Thanks. Yes, you can book it on Airbnb. The listing has all the info you need — and many guest reviews. I also wrote a bit more about it in my latest post. This is the first I have read of your tiny house and I am enchanted. You’ll find a few more posts in the Tiny Thoughts category. I previously had a blog component on my other blog, Tiny House Travelers, but since we’d decided to not build it ourselves, there wasn’t much to update right now, so I’ve removed it. We may start fresh and begin blogging there when we’re moved in, though I’m hesitant to maintain two blogs, especially since ideas of home, place, and space fit here on this blog anyway. We’ll see. Just read the other posts, thanks. I admire you guys for doing what so many of us are dreaming about, and look forward to following your adventures. Less is more! Again Cheri, you’re touching around a broader subject here and your potential take on the peripherally connective is rocking me. You should consider UPS packaging the tiny house to Nelson County, Virginia. That’s if the parcel charge is (and shipping insurance can be found) economically feasible for the hit on your income. No seriously, I could look forward to a newly added bucket list item. The chance to capture that elusive shot of you kayaking out on the Rockfish River. If trying out being Walton-esque simply crimps your style, there’s always Syria, Virginia (slightly further north) and the countryside around Madison and Culpepper Counties. A bump-up commercial enough for just holding an annual WP/Automattic conference at Graves Mountain Lodge or that nominal jet-set zip to metropolitan Washington (DC, not the county.) Oh, and the apple butter making! What another photo opportunity! No again seriously, how could I be hating here? Really, Virginia is for Lovers! Both Minimalists and Bigs Alike. Smile. I just googled images of Rockfish River — how lovely! I think if we decide to venture further out, ultimately, we’ll still stay near California — I’d really like to be somewhat close to my family, all of whom are in Northern/Central CA. But as I’d hinted in another comment, this tiny house is but one component of a bigger dream plan: the ability to travel more, without the house (or perhaps the ability to build/own another tiny house in the UK, where my husband’s family is?). Although you aren’t there yet, it seems that you have embraced this journey with more serenity (no punt intended!). San Francisco and the Bay Area have changed a lot over the last two decades, and I share the soulness feeling you write about. I read once that home is the place where geographic and human characteristics meet, meaning that this place will be different for most of us. It takes time to make sure the components are there to settle, at least for a while. The river spot would win me over since I also like early morning canoeing or kayaking. I smiled when you mentioned doing laundry while writing at the coffee shop, because I do it as well when staying at our small summer Maine cabin. The photos of the little houses where you got to stay are beautiful, and although I won’t take the leap it is very tempting! Best of luck to you and your husband along this unusual life adventure. Thanks for the note, as always. I like this: “home is the place where geographic and human characteristics meet…” Well put. I love the idea of a tiny house–been thinking about it since summer. It’s exciting to read about your ideas and will look forward to hearing about the progress! yes! I too have been thinking about a tiny house lately. actually, for the last few years. we bought a three acre piece of land on the big island of Hawaii with the plan of building our own unpermitted shack, then we ditched that plan after a while. now we are going to rent out our current house so that we can buy a travel trailer and travel around, before finally moving out of the country. however, we think that the time we spend traveling in our travel trailer will give us some insight to where we may one day want to buy land to live in our tiny house! keep the dream alive and I will look forward to watching it unfold. may we all one day live outside of the box! When you say you plan to “travel around,” where will you explore? All around the US/North America? Also, do you think you’ll keep your home in Hawaii when you eventually move out of the country, or is the ultimate aim to cut ties with that land? We sold the land in Hawaii with the plan that we would move to Costa Rica. Now we figure that since we will be out of jobs and free to wander, we are buying a rv and travelling the states, mainly the west coast, for about six months. Then we will head to Costa Rica. However, if we like the rv lifestyle, we will keep doing that for a while. We are not retirement age, so hopefully we will figure out a way to make some money on the road. I know for sure that I want a radically different way of living, so I am open to everything! I was just wondering yesterday how your creative new home was coming along! Ahhh the choices are grand! To be honest, this post really filled me with wanderlust. I’ve given some thought to a tiny home, after my ex-boyfriend brought it up as an option for us before we ‘lived the dream’ in an Earthship. To be honest, I’m not sure which one I’m more interested in, the off-the-grid luxury of the Earthship, or the endlessly-cozy Tiny home. ❤ I can't decide! What an inspirational read! I would love to have a house on wheels! March will be here before you know it! interesting, however I don’t think I could ever do this. I live in a small house (two bedroom and one bath) and that’s small enough for me. I understand it’s not for everyone, I wish you luck. I enjoyed your post, taking a break to read it while I’m going through/purging my stuff. I, too, am working on downsizing, but I’m not yet sure of my next home. I just know it’ll be smaller. Your line about wanting the best of both worlds, of roots and wanderlust, strikes a strong chord within me. In my twenties I lived in a Chevy van for three years exploring the United States. It satisfied my split desire of wanting to explore new places while staying home. It was wonderful in many ways. I imagine you’ll soon have this experience – having a home on wheels means you’ll always be home no matter what beautiful place you park! I look forward to following your journey. What I enjoyed the most was the places of natural beauty. There are so many different flavors of that it’s hard to pick. I love the high mountains – the Rockies, the Sierras, and the Cascades. I love the way palm trees grow together with pine trees down in Florida, and the sands there have tiny shells mixed in. I love the hushed cathedral feeling in the old growth woods on the west coast and the utter quiet of a desert morning. I love swimming in rushing rivers and still lakes and soaking in hot springs staring up at the stars. I love the movement from place to place, and the only regret I have is that I had set aside photography at the time and have almost no photos! When the desire to garden overcame my desire for movement, my top picks to settle were Northern California, Oregon, Arkansas, and Colorado. Oregon won. I would imagine that the tiny house isn’t the best method for this kind of movement, but a mixture of car camping and house-parking will allow you to live such a life! I am curious where your tiny house gets “planted” when it is finished. I am thinking it’s not going to be the final place but certainly one where you and Nick will be for a few years at least. The best to both of you. I am hoping somewhere in the central coast (I see that the Santa Cruz area is one of your preferences at this time). Only because it’s close to my home. See you soon. I find each of these scenarios (and others not described) appealing in their own ways, and I could see us embracing various kinds of settings and locations. That in itself makes me happy — to be able to dive in, adapt, and see what happens. Lovely post. I often wonder where home is to me having lived in a place that has become souless for me yet I continue to live here…for 45 years. It would be so difficult to move and to downsize. Too much stuff! So little time left. Living in 130 sq. feet sounds like hard work. We have plenty of space, Cheri. You could fit the tiny house with pontoons and float to the land down under. We have a creek nearby that leads into a large salt water lake, beautiful kayaking, and bush across the road for hiking. I love the idea of a tiny house and hope yours materializes! Just as the others who commented, I enjoyed this post. I have always enjoyed a curiosity about places and feel I need a new canvas from time to time to explore. It is how we spread our wings and fly. Many do not understand the process and at times I envy them for the stability they enjoy living in one place their entire life yet I feel somehow they missed so much that curious wanderlust affords. When you find that place to park your tiny house, it doesn’t have to be forever and that is the beauty of exploring life. All the best in your search. So enjoyed this post. Thanks. I love reading this post today. I feel the same pull towards a simpler more organic life. I grew up here http://www.new-zealand-travel-showcase.com/coromandel-coast.html, a childhood and adolescence swimming with horses in rivers, sucking fingers dripping in fresh honeycombed honey and a night sky where tracking satellites amongst the stars was easy. Today, I live in Melbourne, Australia. This city is gentle, creative and beautiful … but I miss the chilled embrace of the bush and the restless ebb of Coromandel’s ocean tides. Lots to consider, thank you for your sharing your journey. You grew up in a beautiful location — thanks for sharing that link! I so love this line. Sounds like a difficult but fun decision to make. Good luck! Right up the same alley where my thoughts are these days. I love living in Seattle–LOVE it love it–but every two years, like clockwork, my feet get itchy again. I’m at that place again right now and I wonder–will home ever be a Thing for me? Am I doomed to wander for the rest of my life without putting down roots? Maybe the wandering is part of the process. I suppose I’ll never know until it’s all over but the shoutin’. “Home” is more than just a physical structure–it is people and place and community–I admire you, creating a house to take with you as explore what home means.